Well, that was quite a week! The Ultimate Panini Press Cookbook debuted as the #1 grilling cookbook on Amazon (all right, after Labor Day maybe that’s not all that hard to do, but still – #1!) thanks in large part to all of you, so THANK YOU for your incredible support. 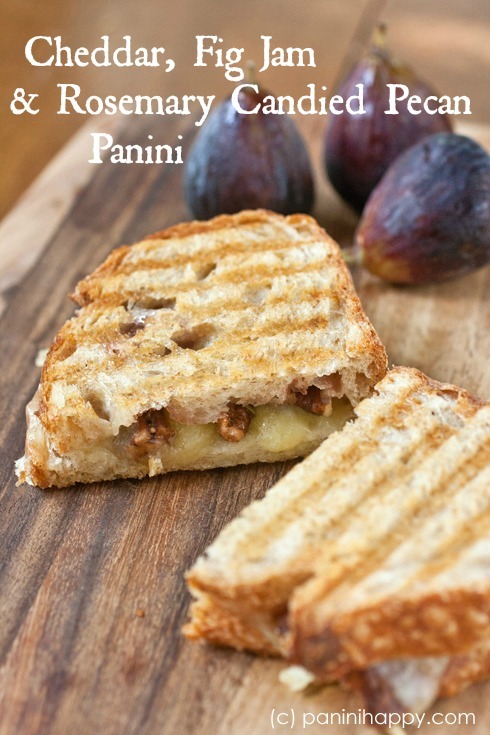 Today’s Cheddar, Fig Jam and Rosemary Candied Pecan Panini might sound a little familiar to some of you – I first shared a similar version almost two years ago, in a guest post on my friend Michael Natkin’s blog, Herbivoracious. Back then, I grilled these sandwiches with apple butter in place of the fig jam, which would, of course, be perfect at this time of year as well. But this time, it’s all about the figs. Last weekend I participated with our local Les Dames d’Escoffier chapter for an event called Fig Fest, celebrating the fabulous fruit. Forty or so local chefs – and me! – prepared creative dishes featuring figs. Tillamook generously provided their Vintage White Sharp Cheddar cheese for our panini, and my favorite local bread bakery, Bread & Cie, provided their amazing country levain. My husband Mike and I turned out at least 200 samples of our panini (by the way, you know you’ve got a good husband when he grills sandwiches and greets customers with you all afternoon long in 85-degree heat when he could be home relaxing with football :-)). I’ll tell you what, it is pretty incredible to watch a whole lot of people taste your food and get their real-time feedback. The Fig Fest patrons really loved my cheddar, fig and candied pecan combination. It’s a little sweet, a little tangy, a bit buttery and with slightest bit of heat from the cayenne in the pecans. One sweet man told me mine was his favorite taste of the day! I can’t say for sure whether he was telling the truth, but let’s just go with it! Heat the oven or toaster oven to 300°F. Line a baking sheet with foil and spray the foil with nonstick cooking spray. Place the sugar, rosemary, salt, and cayenne in a zipper-top plastic bag. Seal the bag and shake it well to combine it all. In a medium-size bowl, whisk together the egg white and water until the mixture is slightly foamy. Add the pecans and toss to coat them well. With a slotted spoon, transfer the pecans to the bag with the sugar mixture. Seal the bag and shake it well to coat all of the pecans. Transfer the coated pecans to the baking sheet and bake them for 30 minutes, giving them a stir with a fork after about 15 minutes. Set them aside to cool. For each sandwich: Spread butter on two slices of bread to flavor the outside of the sandwich. Flip over one slice and top the other side with cheese and some candied pecans. Flip over the other slice of bread and spread 1 tablespoon fig jam on the other side. Place it, buttered side up, on top of the sandwich to close it. NOTE: Any leftover pecans should stay fresh in an airtight container for up to 2 weeks – add them to salads, serve over ice cream, or just snack on them. It’s like turning a cheese plate into a sandwich, awesome! Congratulations, Kathy! You deserve it…your book is fantastic! And this panini…sweet, salty and cheesy. Sounds just about perfect. Yet another delicious recipe, love fig jam. Hi Kathy: Thanks for the book plate. I absolutely LOVE the book, not I think I need to get a better panini maker. I can’t wait to start cooking…Thanks again. Previous post: The Ultimate Panini Press Cookbook is Here…and a BIG Breville Panini Press Giveaway!